WHERE DO YOU GO to build the confidence to take a longer distance shot on a free-range aoudad ram in the desert of West Texas? Rather than shooting a 100-yard zero with your chosen hunting rifle and calling it good, consider taking a two-day Precision Hunter course prior to your hunt. Magpul Core provides such a course taught by Caylen Wojcik. 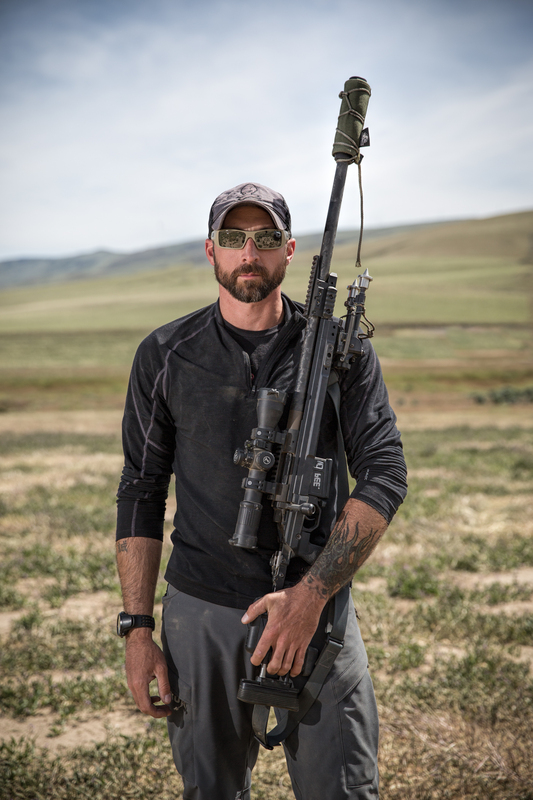 Wojcik spent 11 years in the U.S. Marine Corps as a scout/sniper and sniper instructor. He is a combat veteran that was wounded by an RPG during the Battle of Fallujah, Iraq, in 2004 while moving to a firing position. Today, Wojcik is the director of operations for Magpul Core. This course is built upon the fundamentals of marksmanship, body position, sights, breathing, natural point of aim, trigger control and follow through. Throughout the course, Wojcik stressed the importance of doing the basics over and over to develop good habits, which in turn provides consistent and reliable hits. Sometimes a shooter does not want to fail in front of others and is more worried about their ego than improving on marksmanship. Ask yourself what is more important: Making an ethical shot on an animal or protecting your ego? It’s one thing to shoot steel or paper and miss, but a bad shot on game is not only bad for the hunter (and maybe the guide) but also the animal. It’s the difference between a lifelong campfire story and a hunt you’ll want to forget. Magpul’s Precision Hunter course will build your shooting confidence with your specific equipment to make good hits at longer ranges. The first day starts with two hours of classroom instruction to lay the foundation for the Circle of Components: rifle, optic, ammunition and shooter. All components work together to make consistent and repeatable hits, with the weakest link being the shooter. Wojcik was a calm, confident and knowledgeable instructor; he doesn’t throw a mountain of information at students and expect them to retain it on the range. Throughout the course, he would pause for five to ten minutes to teach and demonstrate the technique before asking us to perform it. His professionalism shined when I needed correction on my prone body position. Wojcik demonstrated an alternative position straight behind the rifle instead of angled. His techniques have been time-tested and battle proven and, although foreign at times, provided better results. He stressed that if you want to learn and improve your shooting skills, you need to have an open mind and a willingness to learn. The shooting range we started with was a 1,400-yard dirt airplane landing strip. A great instructor not only talks the talk, but walks the walk. There were varying size steel targets (6-inch to 18-inch diameter) set up at different ranges on the landing strip. 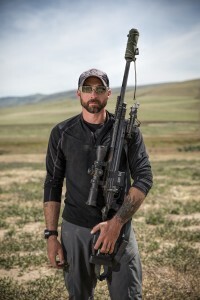 Wojcik uncased his personal 6.5mm Creedmoor bolt-action rifle, jumped into the prone, shot a handheld laser at the first steel target, input the data into his Kestrel and dialed the elevation on his scope. His first shot rang steel at 411 yards. About 2.5 seconds later, steel rang at 836 yards. Leadership by example always works in my book. At the close of the first day, I put 120 rounds downrange through Guns & Ammo’s PROOF Research-built .308 bolt-action rifle project featuring Magpul’s new Hunter 700 stock. I felt 100 percent more confident in it after hitting the same 836-yard steel target when I correctly held for wind. The instruction hammered home: Nothing is more important than a shooter’s confidence. If you can repeatedly hit the center of an 18-inch piece of steel at 800 yards, you’ll be confident to take an ethical shot at an animal at 400 yards. Day two began by shooting a cold bore at 100 yards and checking our zero. We ran a shooting drill where we fired a round on paper at a different shape, checked our shot, worked the bolt to reload, placed the rifle on safe, got out of shooting position and repeat. Sixteen times. This drill helped muscle memory, establishing basic fundamentals of correct body position and the cycle of shot: breathe, muscular relaxation, sight picture, apply trigger pressure, follow through and call the shot. Wojcik teaches improvised sitting positions including this high-angle solution. 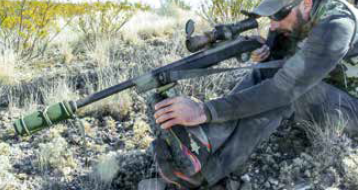 While using sling support, Wojcik stacks his feet and loads the bipod as an alternative to the prone position. Next, a sling was attached to the rifles. Slings not only help with carrying a rifle, but assist with shooting stability when the prone position is not always feasible. A Magpul MS-1 sling was adjusted for length on my rifle with a cross body carry and the option of carrying muzzle up or down. I soon found out how important a sling and bipod are when shooting in the sitting position off two interlocking trekking poles or aluminum walking sticks. Our unknown distance shooting location was from a small rocky knoll at higher elevation with a view of 10 scattered steel targets 304 to 645 yards away. After inputting the lasered distances into the ballistic computer program, I used a Samsung Galaxy 2 tablet with an Applied Ballistics app. I had already entered crucial information into the program: distance of the scope centerline above the bore axis, the ballistic coefficient (BC) of the the ammo, muzzle velocity of the bullet and elevation (4,700 feet). My elevation adjustment in mils was simple enough to dial on the build’s Weaver 2-10X scope, and then I judged the wind hold for each target using the mil-dot reticle. Wind is the biggest non-variable in long-range shooting and usually the No. 1 cause of misses. Wojcik told us to never use mil dots to estimate range on game animals past 200 yards because there is too much room for error. Noted. At the end of day two, the rifle had spit out 200 rounds of Hornady 178-grain BTHP Match ammo with no issues nor any cleaning. I experienced four primers completely blown out of the brass upon firing (meaning these were hot rounds), but no damage was done to the Remington 700 bolt or chamber. Did I mention the PROOF Research barrel was 16 inches? Short barrels and muzzlebrakes equal loud barking rifles. Needless to say, I didn’t make many friends on the firing line and politely tried to stay at one end. Day three started by zeroing our rifles with Hornady Precision Hunter .308 load featuring the new 178-grain ELD-X bullet. This is what I would be using for the aoudad ram hunt, so it was good to earn confidence in it. I shot the 178-grain boattail with a long-range “heat shield” for a ballistic tip, which was designed to resist deformation through aerodynamic heating. After shooting 20 rounds, I only adjusted .2 mils for the elevation difference at 836-yard steel targets compared to the Hornady 178-grain Match load. Time to get down to business and put this training to the test. Before stepping in the field to hunt an aoudad sheep, I felt confident in what this rifle, optic and ammo could do; now the weakest link just had to do his part. I always thought West Texas and the desert was hot, even in the winter. However, on this early January morning, the mercury in the thermometer was reading barely 10 degrees. This Midwest farm boy will take the cold over 100-degree heat any day, so let’s do this. I was eager to hunt this 46,000-acre private ranch near the Mexico border and Big Bend Texas State Park, where mule deer and aoudad run free. Horse Creek Outfitters guide Tom Martiny, an Idaho native with 12 years of guiding experience, led our hunt for aoudad. Martiny took us to a secluded rocky ridgeline where we started glassing for the light-brown colored aoudad ram. About three hours later, a lone ram was spotted about 650 yards away. We moved to a better vantage point and stalked to within 396 yards, according to Martiny’s laser rangefinder. While we were moving, the animal lay down and was looking into the wind away from our position. I could only see the top of his head and horns moving side to side because his body was hidden from view. This was as close as we could get due to a large valley. Martiny had me set up a good supported prone position in a rocky outcropping, and I dialed up 2.3 mils on my scope elevation for 400-yard distance. Now, it was time to play the waiting game. This actually played in my favor because it gave me time to whisper to Wojcik and read the 6 to 8 mph left-to-right full value wind that was a 3/4-mil left hold. 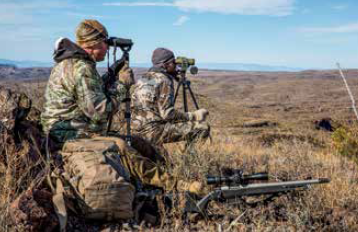 Tom Martiny of Horse Creek Outfitters guided G&A’s four-day hunt spotting free-range aoudad on more than 46,000 acres. What seemed like an eternity watching this ram’s head move back and forth was more like 20 minutes. Then Martiny said, “He’s getting ready to stand up.” As the ram stood and began to fill my sight picture, the week’s training kicked in, even though my heart was beating heavily. The ram turned almost broadside and looked straight in our direction. I took a deep breath, exhaled, then slowly squeezed the trigger to the rear, holding the reticle 3/4 mils left of his left chest shoulder area to compensate for wind. When the Hornady ELD-X round was fired, the shot startled me because I forgot to use any ear protection. Then I watched through my scope as the ram reared up on its back legs when the bullet entered the left shoulder area, causing him to fall backward out of sight. Martiny and Wojcik both confirmed it looked like a good hit. After a 30-minute wait, we headed to the ram’s last seen location — and there he lay. Martiny started capping the ram, so I hovered, hoping to see how the bullet performed. The terminal ballistics of the ELD-X bullet punched through the left shoulder bone, expanded enough to go through the heart, taking out both lungs and causing severe damage to the right shoulder. The bullet broke apart in two pieces and came to rest in the right shoulder hide area. The bullet did not exit the animal. I was very fortunate to have such professional training and the opportunity to put that training to the test. The proof is in the hunt. I’m not sure I’d have felt confident enough to pull the trigger on an animal 400 yards away without the two days of Magpul’s Precision Hunter training with Wojcik. I showed up to this course with a rifle I’d never fired, but I left with a data book full of knowledge and a hunger to learn more. I’ll forever remember this experience because I learned more about myself and met with shooters who love to hunt, delight in telling great stories and can savor good sipping whiskey.